AgriBio, Centre for AgriBioscience comprises some 33,000 square metres of research laboratory, glasshouses and office accommodation for 400 researchers and students. 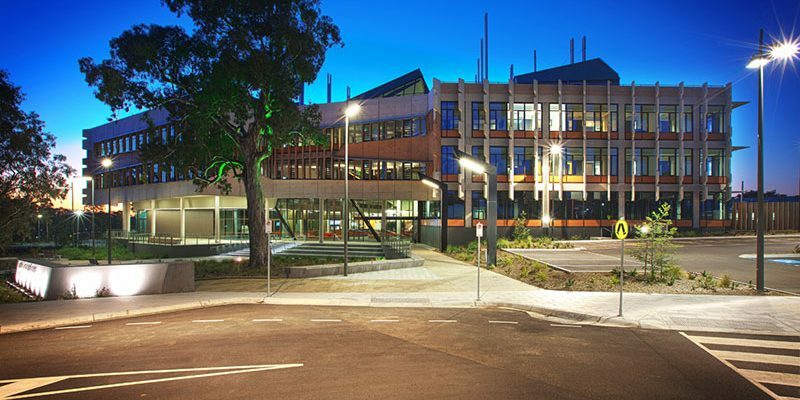 Located at La Trobe University’s Melbourne campus in Bundoora, the project is a joint initiative of the Victorian Government, through the Department of Environment and Primary Industries (DEPI) and La Trobe University (La Trobe). The external facility accommodates a large “head house” which supports a number of glass houses, screen houses and polyhouses attached to either sides. The facility supports the State of Victoria’s multi-billion agricultural industry by improving productivity, fighting disease, reducing environmental impact and safeguarding food security. Hexima’s new $2 million glasshouse facility located at La Trobe University’s Research and Development Park in Bundoora was officially opened today by Ms Maria Vamvakinou MP, Federal Member for Calwell and Chair of the Standing Committee on Innovation, Industry and Science. Hexima’s impressive 1200 square metre facility houses Australia’s leading corn transformation facility. It is crucial to the success of Hexima’s development of products to combat fungal disease. The new corn transformation and tissue culture facility contains extensive glasshouse space, growth rooms and laboratories for tissue culture and analysis. The Victorian Government and La Trobe University are investing $288 million in a world-class centre for agricultural biosciences research and development at a site adjacent to the new Hexima facility. The Federal government and the University are also investing $94.3million in the new La Trobe Institute of Molecular Sciences (LIMS) which will accommodate the Hexima gene discovery team.